I am blessed to be able to share with you this beautiful story coming with Taiwan, about how God used some of our Incarnate 2018 Graduates in a powerful way in Taiwan, to communicate some of the deeper truths we hold in the Kingdom of God. 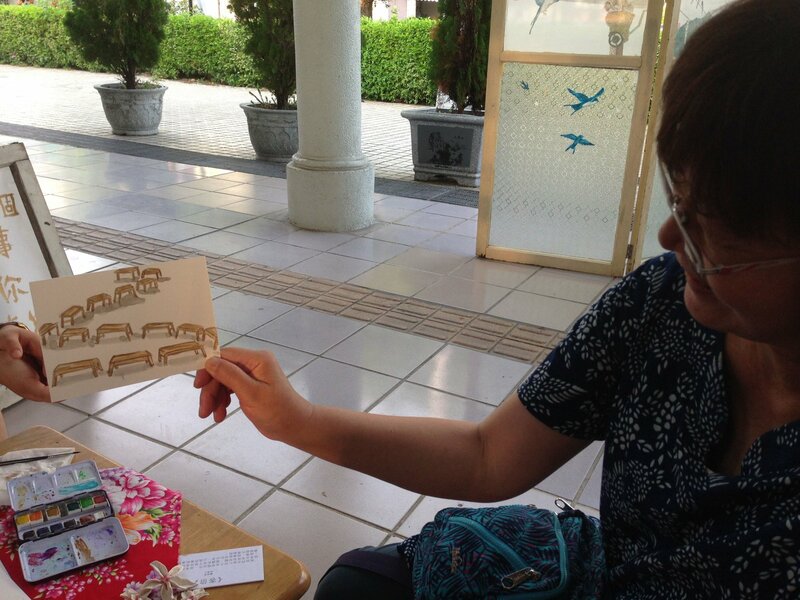 Taiwan: A local woman receives a postcard hand drawn by a visiting Incarnate artist at an art exhibit put on by OM in Taiwan. In May 2018, OM Taiwan received three Christian visual artists from the U.S.A., East Asia and Hong Kong. Before they came, they had received a three-months training in Italy with OM Arts Incarnate – where they lived with various Christian artists from all over the world and learnt how to exercise their artistic gifts for the Lord. After the training, they stayed for one month in Tong Luo, a Hakka town. In Taiwan, the Hakka people are considered least reached, with only a 0.2% evangelical Christian population. The artists were asked to create artwork which reflected the characteristics of the Hakka people as well as Christian values. By connecting with locals, the artists were able to find some cultural Hakka elements to include in their artwork. These pieces were pulled together in an art exhibition at the Tong Luo train station – the most populated public area in the small town. The main purpose of the exhibition was to reach out to those who did not know Christ. The OM team had never done a one-week long event in the train station, and were not sure if the permission would be granted to do so. Surprisingly, when they met the train station master, he did not ask too many questions. Within only a few minutes, the permission was given for the exhibition. The OM team believes that it was God who opened the door for the event to happen in that location. These three artists have different artistic styles. Jane* from East Asia creates artwork using languages and words. One of her pieces was to separate Hakka into "Hak" and "Ka", which in Mandarin can mean 'guest' and 'home.' Then she wrote 'What is home?' and 'What does it mean to be a guest?' on a large sheet of paper. Many visitors came and left their comments. One uncle wrote, "I am a Hakka. I eat my dinner and watch TV every night." A team member wondered why he wrote this because it didn't seem to have anything to do with being Hakka. The elderly man explained that his children all work in other cities, his wife passed away a few years ago, and therefore, every night he watches TV together with the photo of his deceased wife and has his meal all by himself. He expressed his deep feelings towards the words 'guest' and 'home' because even though physically he was at home, emotionally he felt like a guest. This man visited the team every day during the exhibition to chat with them. Through these conversations the team learnt to deeply feel and identify with the loneliness of the elderly in the community. Sherrie from the U.S.A. often projects her own situation and feelings into her work. In this exhibition, she decided to use 3-D abstract objects to express her concept. Sherrie grew up in the U.S.A. as a second-generation Taiwanese descendant as both her parents are Taiwanese. She created an artwork named 'Conversation.' She explained that in Chinese society, it is quite difficult to have a real conversation within families. Even though parents love their children, they seldom express their love verbally. In her piece, she reflected that people should strip away their pride and societal norms and allow God to give the courage to be real and talk to each other. Her artwork reflected the family situation of the town because many parents work in other cities and leave their children with the grandparents. Grandparents usually express their love to their grandchildren by providing for their material needs but are not good at conversing with them; seldom expressing their love verbally. Sherrie's artwork was something that the younger generation could easily identify with. Amy from Hong Kong created an artwork named 'Guest Postcard.' She, as a guest in the town, invited locals to sit down at a table and share their Hakka stories with her. After that, Amy would make a hand drawn postcard according to what they shared and mail the postcard to them from Hong Kong. However, the project did not go well at first because people did not have the time to stay long. So Amy adapted and had visitors share their stories, and then select a prayerfully pre-prepared painted postcard in an envelope. People then opened the postcard and miraculously, almost all the visitors got one that matched their stories. The team believed that it was the guidance of the Holy Spirit. A retired elementary school principal came to the exhibition and was amazed when she got a picture of many chairs lined up in a queue just like in a school setting. Amy explained the meaning of the postcard to the principal: That the chairs symbolised children waiting for help, and whoever choose this card would be the one who helped them. The principal responded that it was exactly her situation. This principal is not a Christian yet, but has partnered with the OM team for campus ministry for many years. She helped them expand the ministry among other schools. Last year she retired and the team has been praying that God would continue to use her in new ways; most importantly that God would draw her close to Himself. Artists often use metaphors to express their ideas and look at things from different perspectives. Their artwork helps people think deeper into the reality behind the surface. Even though the artwork itself is not a direct communication, it provides many interactive opportunities for the communicators and visitors do not feel they are forced to listen to a lecture. Instead, they take the initiative to interact with the artwork and chat with the creators. In this exhibition, the OM team had many chances to share the gospel and their own personal testimonies with visitors. One said "We experienced how Art combined with the Word of God and the guidance of the Holy Spirit can lead people to the Truth."